How can we measure charter school success? It’s an important question this time of year, as Congress considers funding for our national priorities and our opponents denigrate the value of giving parents public school choices. The National Alliance has been working closely with the House and Senate to push back against false narratives and ensure that the federal Charter Schools Program receives a boost in funding, so that more students can gain access to high-quality charter schools. each dollar invested in a child’s K-12 schooling in charter schools yields $6.37 in lifetime earnings compared to $4.41 in lifetime earnings for each dollar invested in traditional public schools. In the researchers’ words: “On average, for the students in our cities, public charter schools are 40 percent more cost-effective and produce a 53 percent larger ROI than [traditional public schools].” Nathan Barrett, Ph.D., senior director of research and evaluation at the National Alliance, provides other key takeaways from the report. I know most parents don’t think about schools in terms of ROI. But policymakers do. And parents want to know that the school they send their child to will produce economic benefits that last a lifetime. It’s now clearer than ever that charter schools are delivering real impact for students—which makes it all the more important that cities, states, and the federal government continue investing in charter schools to help more students realize these benefits. While Congress is deliberating funding for fiscal year 2020, you can click here to contact your members of Congress and ask them to support the Charter Schools Program. It’s a simple action for you that could generate a big return for students. The National Alliance recently published the latest edition of A Growing Movement: America’s Largest Charter Public School Communities. Over the past ten years, enrollment in charter schools has increased by nearly 2 million students—and the number of school districts with a significant charter school presence continues to grow too. When the National Alliance published the first edition of this report in 2006, only one district—New Orleans—had more than 30 percent of its students enrolled in charter schools. In 2017-18, 21 districts had at least 30 percent of their students attending charter schools. Click here for the full report. 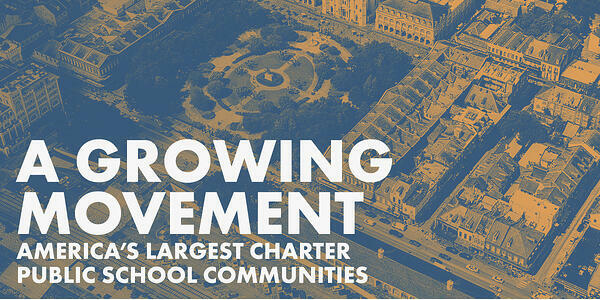 Join the National Alliance to celebrate the public charter school movement, May 12-18! 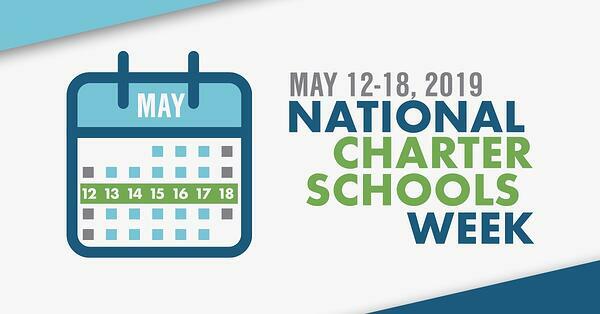 National Charter Schools Week is a chance for students, teachers, leaders, parents, supporters, and advocates to come together to show how charter schools are committed to providing high-quality public education to students nationwide. Sign up to receive updates on the week’s festivities! President Trump released his FY 2020 budget, which requested $500 million for the Charter Schools Program, an increase over the current funding level of $440 million. (The National Alliance issued a statement.) The president’s budget expresses his goals, but it’s ultimately Congress that will determine spending levels for next year. Secretary DeVos appeared before House and Senate subcommittees last week to defend the overall education budget, which would deliver cuts to many programs. Before the secretary’s first hearing appearance, a group led by Diane Ravitch and funded by the teacher unions released a data-free “report” packed with unsubstantiated claims of mismanagement of CSP funds. The National Alliance pushed back with a strong statement about the report’s flaws and our senior vice president of advocacy, Amy Wilkins, published a response to an article in the Washington Post. We continue to be heavily engaged with friends on both sides of the aisle and in both the House and Senate to secure an increase in CSP funding. You can lend your voice to the effort by clicking here. The House Education and Labor Committee held a markup of the Rebuild America’s Schools Act. It passed by a party line vote of 26-20. In the bill, charter schools are eligible to apply for funds as public schools and funds are prioritized for schools in buildings in the greatest need of repair. Two amendments passed that impact the eligibility of certain charter schools. One amendment makes charter schools “operated by for-profit entities” ineligible to apply for funds. A second amendment addresses charter schools that rent property from private entities. The prospects for the bill are unclear in the divided Congress, but we will continue to work with our congressional partners to ensure that charter schools have meaningful, equitable access to these funds should this bill become law. A bipartisan coalition introduced the New Markets Tax Credit (NMTC) Extension Act of 2019 in both the House and Senate. The NMTC is an important community development tool that, among other things, helps charter schools access facilities. The bill would provide an indefinite extension of the NMTC, increase funding to over $5 billion, and index future allocations to inflation. Visit the coalition website for information about how to thank the original cosponsors or to call for your members of Congress to support this critical driver of economic development in low-income urban and rural communities. A bipartisan cohort of Colorado’s House Education Committee voted overwhelmingly to preserve a funding stream for the state’s charter schools. The bill sought to reverse a 2017 law that provided more equitable funding to public charter school students. While the regular legislative session ended in West Virginia without lawmakers enacting a charter school bill, the legislature will be reconvening for a special session focused on education reform later this spring. We are working with our key partners and legislators to make sure that a strong charter school bill is enacted into law during the special session. We have also started working with our key partners in South Dakota to prepare for a major push to get a charter school law enacted in that state in 2020, and we are working with key partners in Alaska and Iowa to overhaul their charter school laws either this year or next year. We were able to get our bill to strengthen full-time virtual charter school accountability and funding passed through two committees in the New Mexico Senate. However, our efforts were stalled in a third committee there before the session ended. We plan to be back there in 2020 to finish the job. We are also working with partners in Nevada and Ohio to get legislation enacted to strengthen full-time virtual charter school accountability and funding in those states. The Alabama State Supreme Court cleared the way for the first charter school to open in the city of Montgomery. The court overturned a lower court’s ruling in a suit brought by the Alabama Education Association as a tactic to stall public school choice in the city by preventing LEAD Academy from opening as scheduled in fall 2018. A statement from the National Alliance called the decision “a victory for Montgomery parents and students.” LEAD Academy is now making plans to open in August 2019. Science teacher Lynne D. Holcomb-Gober shares why she loves teaching and how she gets her students involved and interested in science at Friendship Charter School’s Blow Pierce Elementary & Middle School in Washington, D.C. Latoye A. Brown, CEO of Audubon Schools and a participant in the National Alliance’s School Leaders of Color cohort, shares her experience serving as an educational leader in the post-Katrina landscape. A few years into the open source curricula experiment, we are starting to see that teachers will embrace quality content regardless of its origin and that a home-grown school curriculum can compete with big publishers when it comes to quality indicators. Claire Kaplan, executive director of Match Export, explains what her venture has found. Harley Place, an ESL teacher and coordinator at Ocean Academy Charter School, describes her school’s Latino Family Literacy program, which promotes the importance of reading at home. In the hallways of KIPP DC, you’ll find members of one of the music industry’s hottest entertainment groups—The String Queens, a highly-acclaimed trio that is changing the arts education landscape in our nation’s capital. Read a Q&A with one of the members. Addressing Facility Needs: States can help public charter schools overcome a huge obstacle to their stability, growth, and ability to provide high-quality options to students simply by providing schools with access to affordable financing to build their own facilities. A new policy brief by ExcelinEd, Addressing Charter School Facility Needs: Actions for States, identifies actions state policymakers can take to accomplish this. A new report from the School Choice Demonstration Project at the University of Arkansas finds that, on average across eight major cities, “public charter schools are 40 percent more cost-effective and produce a 53 percent larger ROI than [traditional public schools].” Each dollar invested in charter schools yields higher NAEP scores and higher lifetime earnings for students than equivalent investments in district schools produce. Click here to read the full report, including additional conclusions and city-level data for Atlanta, Boston, Denver, Houston, Indianapolis, New York City, San Antonio, and Washington, D.C., or read key takeaways. The National Association of Charter School Authorizers (NACSA) released a report this month on the types of charter schools applying for and receiving approval. NACSA examined nearly 3,000 charter school applications in 20 states to authorizers that oversee nearly two-thirds of all charter schools nationally. Read the full report findings. And read an analysis of the report by Nathan Barrett, the National Alliance’s senior director of research and evaluation. A new report from CRPE takes a look at charter school unionization and teacher motivations. The report finds that overall charter school unionization isn’t increasing and that teachers turn to unions when they lose faith in administrators. Read the full report for four more key findings. Get Ready for NCSC 2019! We’re less than three months away from the 2019 National Charter Schools Conference, June 30 - July 3 in Las Vegas! Click here to lock in your spot. And be sure to check out this 60 Minutes story on closing the gender gap in tech, which features one of our keynote speakers, Hadi Partovi of Code.org. The National Alliance is currently recruiting a Data and Research Manager and a Communications Coordinator. Please click here for more details and pass the word to great candidates! And don’t forget to visit our Charter School Job Board, which includes job openings for a variety of positions across the country. It’s a great resource for organizations looking to hire and for individuals looking to make a difference in the lives of students.